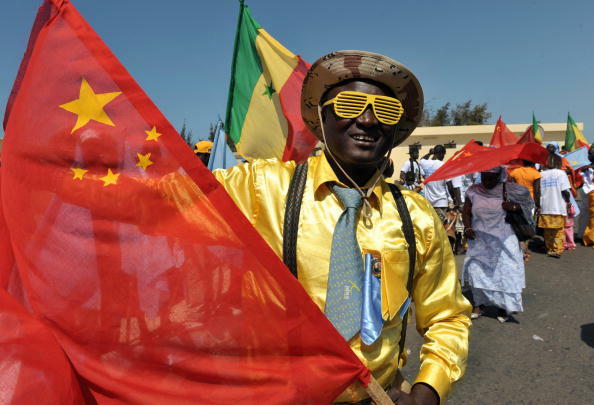 A Senegalese man waves a Chinese flag as he waits for Chinese President Hu Jintao’s arrival in Dakar, February 13, 2009. It wasn’t that long ago when it was all smiles between the Chinese and Africans. The headlines were all about “win-win” development, China’s role in helping Africa to rise above its colonial past, and investment—lots and lots of Chinese investment. Every year, trade between the two would surge to new, record highs. Those were indeed good days. Now, things are different. A seemingly never-ending slump in commodity and oil prices is taking its toll on Africa’s export-reliant economies, prompting fears of a new, devastating debt crisis. Chinese trade and investment in Africa are also slowing as China undergoes a profound economic transformation from a manufacturing-led economy to one driven by services and consumption. In many parts of Africa, the Chinese are encountering new challenges: the violent conflicts ravaging parts of North Africa are embroiling Chinese peacekeepers, Chinese civilians have been the victims of terrorism, and the Chinese are reportedly becoming less and less popular on the continent. Jonathan is an accomplished global affairs scholar with expertise in the Middle East and Southeast Asia. He is an Associate Fellow at the International Centre for the Study of Radicalization at King’s College London and a Senior Advisor to the Chertoff Group in Washington, D.C. He is also a member of Chatham House in London and the Council on Foreign Relations in the United States. Jonathan joins Eric and Cobus to discuss his current research and why moving on from the Sino-African honeymoon may not be such a bad thing.